Sure, it may be easier to just grab some peppermint patties at your local grocer, but remember that everything you put in your body is either helpful or harmful. Chances are the peppermint patties you find at the store are filled with harmful ingredients, not to mentions tons of sugar that definitely kick you out of ketosis faster than you can say peppermint. These Keto Peppermint Patties are keto, duh, paleo, gluten free and can be make dairy-free. They’re the perfect little feel good snack, or treat, and the best part is they contain a plethora of health benefits. From improving your brain function to boosting your oral health and digestive health, these low carb, Keto Peppermint Patties are a surefire way to give your body the proper fuel to get you over that hump. Besides giving your tastebuds a cool rush, these treats also pack a strong boost to your brain. Peppermint is a powerful natural ingredient that has the ability to awaken your body and provide a feeling of invigoration. Studies have shown that through both ingestion and inhalation, peppermint oil has the ability to enhance your mental function, concentration and alertness [*][*]. Coconut Oil is packed with MCTs (Medium-chain triglycerides) which are quickly converted to energy for your body and brain. Besides providing a boost to your brain, these have been shown to directly aid in the prevention of cognitive disorders such as Alzheimer’s [*][*][*]. Dark chocolate is an incredibly flavanol-rich ingredient and provides powerful fuel to your brain. Not only will it give your brain an increase in focus, but research has shown that it can improve the conditions of those suffering from various cognitive complications and diseases [*][*][*]. It’s no wonder that so many oral hygiene products utilize peppermint as a central ingredient. It delivers a natural freshness to your mouth and can improve your oral health in various ways. Multiple studies have shown how powerfully effective peppermint can be with improving breath freshness, killing oral bacteria and germs, and even aiding in the reduction of plaque buildup [*][*][*][*]. When looking to improve your oral health, coconut oil is always an excellent ingredient to incorporate. Coconut oil is rich with antibacterial properties that can cleanse your mouth of harmful bacteria and germs. The most effective method of accomplishing this is through oil pulling [*]. Among the numerous benefits already described, Peppermint can also aid in digestive health. Most significantly, through its natural ability to aid in muscle relaxation and relief, peppermint can assist with reducing painful stomach aches and symptoms of conditions such as IBS [*][*][*][*][*]. Coconut Oil has the ability to not only remove harmful bacteria from your gut but to also repair the lining and overall flow of your digestive system. Just another reason why coconut oil is an incredible ingredient for your health. By making this candy recipe in the comfort of your own kitchen, you’re probably going to have a greater respect for what goes into making them that it’ll be harder for you to guzzle down six at a time. These are pretty tasty though, so we won’t judge you if you do eat six at a time. Great to make when you’re short on time, you’re definitely going to want to add these to your holiday keto friendly recipe list, just saying. 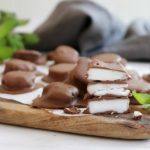 These Keto Peppermint Patties are such an easy treat to make that will leave you feeling satiated, healthy, and fueled. Combine 1/2 cup coconut oil, milk, stevia drops, peppermint extract and powdered sweetener to a medium sized bowl. Whisk until smooth and mixture begins to thicken. Drop mixture by the spoonful onto a parchment lined baking sheet and press into desired shape. Freeze for 10 minutes to harden. Melt chocolate chips and 2 teaspoons of coconut oil in the microwave in 15 second increments until smooth or in a pot under low heat on the stove. Coat peppermints with chocolate, shake off excess and place back onto cookie sheet. Place in fridge to set for 20-30 minutes.